« Why Study Village Finance? poor people’s savings. He recognized that anyone who wants to improve their economic condition needs both savings and loans. Village-based financial intermediation can profitably address this problem. The credit-only high road has left poor people still saving as their ancestors did — converting cash into chickens and pigs, and hoping animals and market prices are healthy when they need cash for school or medical costs, or working capital. 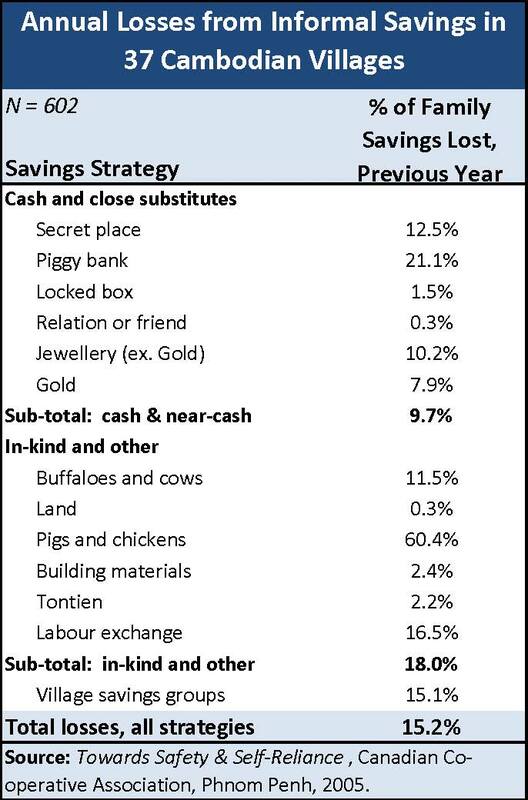 A study I conducted for the Canadian Co-operative Association found that, in Cambodia’s villages, this means an average negative 15% return on ‘at-home’ savings annually. This return is far more volatile than most equity markets — though poor people don’t have the luxury of long time horizons. The questions about the road ‘less traveled’ are not questions we have been asking. How do we nurture healthy village institutions? How do we develop village capital markets? How do we catalyze market-based networking and wholesale services? The road is overgrown; it awaits our labour.